AROMA BALSAM Christmas Trees (a PLC Resources Ltd. Company) is a Christmas tree farm and wholesaler of fresh Balsam Fir trees. We are located in the province of Nova Scotia. Our province is the largest producer of Balsam Fir in the world. When you buy Canadian Christmas trees from us, your order will be custom cut to your requirements according to the description, grade and delivery date you require. See our "TREE GRADES" page to select the trees that will help you outsell your competition. We guarantee consistent quality because each of our trees is manually tended during all phases of the growing cycle. This includes hand pruning by highly trained and experienced workers, producing natural looking trees with an appealing look. 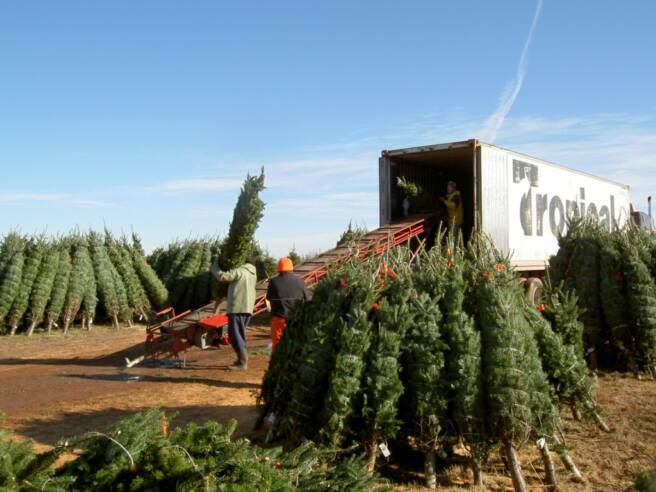 Aroma Balsam Christmas Trees supplies wholesale Christmas tree quantities ranging from 300 (USA) to "Truck Load" quantities to all markets in North America, Mexico, Venezuela, Puerto Rico, and the Caribbean as well as to many other Latin American and world markets. Our international exporting and logistics expertise, great prices, and gorgeous Christmas trees have made Aroma Balsam Christmas Trees a preferred supplier of Balsam Fir. Most importantly, at Aroma Balsam we are committed to the practice of sustainable farming. Our trees grow naturally, their seed is dispersed by the wind in a continual source of natural regeneration. We also interplant our fields with superior genetic seedlings. We Protect the Environment by using Integrated Pest management where we limit the use of chemicals to an absolute minimum in order to control damaging insects and weeds. In this way we protect the natural habitat of birds and wildlife and are able to maintain a natural and healthy ecosystem.